MSI has shown for the first time its laptop computer with a keyboard that flips over to reveal a sensor pad for pen input. 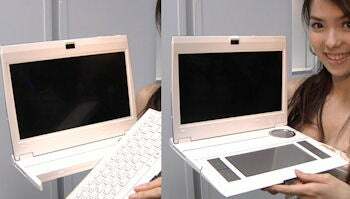 The Sketch Pad, which is still a prototype, was unveiled at the same time the company launched a Windows 7-based tablet PC. At first glance the Sketch Pad looks like a normal laptop. But take hold of the keyboard and it can be rotated around to reveal a pad for pen input. The pad would normally be hidden on the base of the laptop and, when flipped, it comes to the top and the keyboard is out of view. "I think this is really cool," said Sam Chern, product director at MSI, speaking at a Taipei news conference. "You can use your handwriting, and we also built in recognition software." Laptops with pen and handwriting input have been available before but they have typically relied on a touchscreen for input. Pen-sensor pads haven't been used because of the limited space around the keyboard and the need to keep a laptop small. The new design from MSI gets around the space problem. MSI didn't offer any technical details about the laptop or say when it might go on sale. The new tablet PC, called the Wind Pad, has a 10-inch screen and will be available later this year with features including built-in 3G and Wi-Fi, GPS and HDMI high-definition video output. 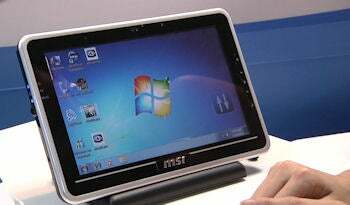 The Wind Pad 100 features a user interface designed by MSI. It has big buttons that act as shortcuts to frequently used features and is intended to make touchscreen navigation with fingers an easier experience than the basic Windows interface. The battery can last around 8 hours, according to its specifications. It's based on an Intel Atom processor. 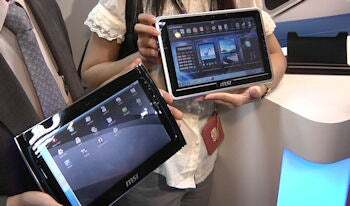 MSI also showed off a tablet PC, called the Wind Pad 110, based on an Arm processor from Samsung and Google's Android operating system. No details were available on this machine. The Windows 7 model should be available later this year. MSI didn't provide any pricing details. The machines are among several tablet PCs that are expected to be launched this week as the annual Computex IT expo takes place in Taipei. The event is the biggest annual showcase for Taiwan's IT industry and many of the island's PC makers are pursuing tablet designs after the launch success of Apple's iPad.